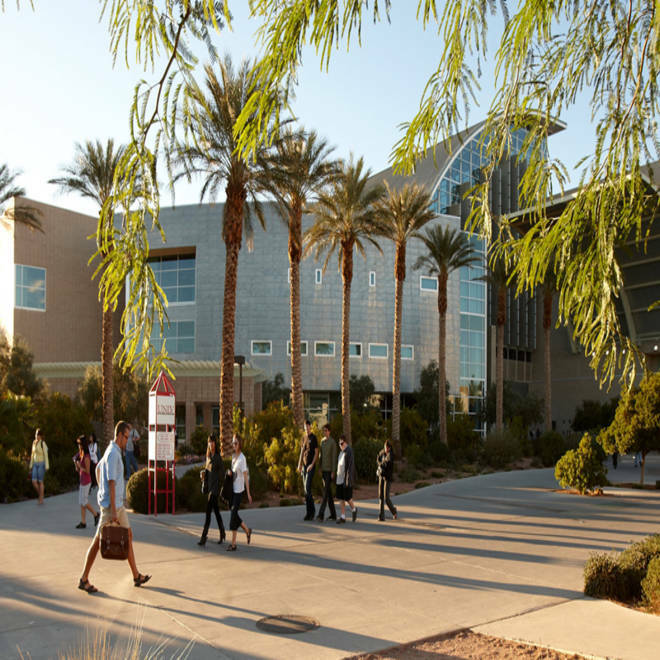 The campus at the University of Nevada Las Vegas, which would be affected by a dramatic proposed change in the way the state's public universities are funded. LAS VEGAS — Just off the graveyard shift, Aaron Starks refuels with coffee in the early-morning quiet of the student union at the University of Nevada, Las Vegas, steeling himself for his classes in electrical engineering. Starks, who’s 27 and raising a 19-month-old daughter, is in his third year at UNLV, persevering in the face of not only sleeplessness but deep state budget cuts that have forced courses to be canceled, programs eliminated, faculty furloughed and services exasperatingly scaled back — all while tuition has soared. Many other students in Nevada, however, are giving up. In this world-famous gaming capital, the odds are stacked against them. Just 36 percent earn their four-year degrees within even six years, a smaller proportion than in any state except Alaska. And as tuition rises, enrollment has been falling. That, accompanied by an exodus of college-educated workers, has further shrunk the proportion of 25- to 34-year-olds in this state with degrees, already the lowest in the country. When Starks is finished, he intends to leave, too. Can colleges lead the state? A poster child for the financial predicament in which public colleges and universities find themselves — and the degree to which education is connected to economic vitality in 21st-century America — Nevada is now proposing a dramatic turnaround under which it hopes this same battered public higher-education system will help lead it out of economic crisis. By changing the formula under which colleges and universities are funded, policymakers plan to reward institutions for turning out graduates and research that can build new industries in a state that has proven far too vulnerable to downturns in the dominant areas of gaming and construction. A Brookings Institution report last year found Nevada overly dependent on a consumption economy acutely prone to booms and busts, with “substantial” shortages of skilled workers and too little investment in innovation. Six of the top 10 employers are casinos. As in other places, lawmakers in Nevada have now come to see higher education as a solution to these problems. And with the nation’s worst unemployment and home-foreclosure rates, it’s an ideal laboratory to test this idea. State Sen. Steven Horsford, a Democrat who chaired the committee that recommended the new funding formula, puts it more succinctly. “We have nowhere to go but up,” he says. If approved by the full Legislature and the governor, the change would mean that all taxpayer money for colleges and universities would be divided up beginning next year based not on how many students they enroll, but how many credits those students successfully complete. “We want to fund institutions based on student success,” Horsford says. The plan would also provide financial incentives for universities to concentrate on fields that could help revive Nevada’s economy, including natural resources and conservation, engineering, biological and biomedical sciences, architecture, and nursing. That’s unique among the several states that have instituted so-called “performance funding” for their public colleges and universities, says Martha Snyder, an education-policy specialist at HCM Strategists and a former U.S. Department of Education policy adviser who specializes in this topic. But while the plan would alter the way existing money is parceled out, it won’t necessarily add any new funding. Since the state collects no personal or corporate income tax, and sales taxes are only incrementally recovering from the economic downturn, there’s little chance that higher-education spending will soon increase. Many Nevada university administrators and faculty are in favor of the change regardless, because, among other reasons, it gives them more control over the proceeds from tuition, which now go into a central fund and are redistributed around the state — meaning students at large urban institutions end up subsidizing their counterparts at small, rural ones. But the irony is not lost on them that they’re being asked to come to the rescue of the same leaders who have deeply reduced their budgets. Could raising salaries be the best way to attract and keep better teachers? In Nevada, that canary is already in intensive care. The state has never made higher education much of a priority. On the wall of his office, Smatresk has photos of the few buildings on the original UNLV campus of the early 1960s, then an outpost in the desert derided as “Tumbleweed Tech.” Recent cuts have made things worse. Fewer than two of every five UNLV students earn bachelor’s degrees within six years, according to the National Center for Higher Education Management Systems. And just 10.8 percent of full-time community-college students in Nevada get their two-year degrees in three years, the organization Complete College America reports. When nearly 60 percent of jobs will require a career certificate or college education by 2020, the Census Bureau reports that only 29.5 percent of 25- to 34-year-olds in Nevada have one — the lowest proportion in the country, and falling. Yet as tuition has increased 160 percent over the last 10 years to help make up for state budget cuts, enrollment in the state’s public universities has dropped sharply. Last year, the number of students was down 7.7 percent statewide. Meanwhile, many college-educated people left when the economic downturn hit Nevada hard. And soon-to-be graduates like Starks see little incentive to stay, with 53.6 percent of degree-holders under 25 unemployed or underemployed, according to a recent analysis by Northeastern and Drexel universities and the Economic Policy Institute. The new performance-funding proposal seeks to use the universities to break this cycle. “There are those of us who believe we cannot diversify the economy into the economy of the future without a more robust public higher-education system that not only invests more over time, but aligns itself in the right way with the jobs we’re trying to create,” Horsford says. Still, a “knowledge fund” set up by the Legislature to encourage research that can be commercialized has no money in it; the state board of regents has asked for $10 million for this purpose — a tiny sum when compared to similar efforts in states including neighboring Utah, whose Utah Science Technology and Research initiative, or USTAR, got $179 million, plus $15 million in ongoing annual funding for research teams at the University of Utah and Utah State University, and $160 million toward the construction of $200 million in new research facilities at those schools. Some faculty also worry that, in their desire to meet the new state goals, colleges and universities will simply make it easier for students to complete their courses. “Bull,” responds Sondra Cosgrove, former faculty senate chair at the College of Southern Nevada, who teaches Nevada history. Although she says she wouldn’t lower her own standards, Cosgrove fears that other long-suffering faculty might. Besides, she says, for all of the anticipation about it, the performance-funding plan won’t pump more money into public higher education (though her own college will benefit, to the tune of several million dollars, from the new distribution formula). This story, "Nevada asks battered universities to solve its economic crisis," was produced by The Hechinger Report, a nonprofit, nonpartisan education-news outlet based at Teachers College, Columbia University.